CMA Doc: Richard Chinnock, M.D. Pediatrician Richard Chinnock, M.D., was recently recognized with the Outstanding Clinician Award at the Loma Linda University Children’s Hospital Foundation’s 26th annual gala. Dr. Chinnock—who is the hospital’s chief medical officer—was honored for his lifelong dedication and distinguished service provided to children and staff. Dr. Chinnock is the son and father of pediatricians. He says, like other members of his family, he was meant to work with children — loving their willingness, innocence and joy. 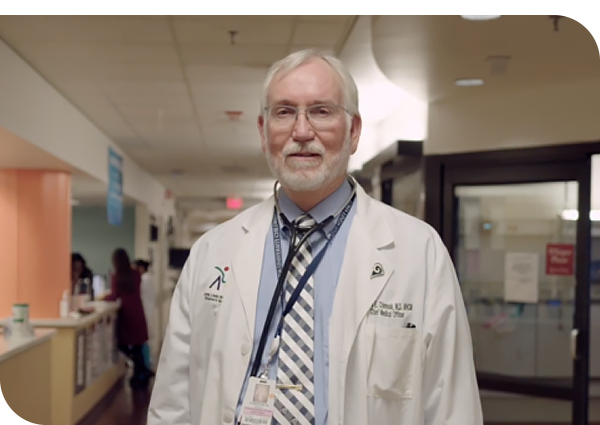 He has dedicated more than 25 years of service to Children’s Hospital. Dr. Chinnock was first hired at Loma Linda University Medical Center in 1989 to be part of the pediatric heart transplant team. He has taken on many roles during his career, including pediatric residency director, medical director of the pediatric heart transplant team, professor and chair of pediatrics for Loma Linda University School of Medicine. Dr. Chinnock was named as chief medical officer for Children’s Hospital in 2015. Fresh out of his undergraduate program at Pacific Union College, Dr. Chinnock was a recipient of a U.S. Navy scholarship, financially allowing him to earn his MD at Loma Linda University’s School of Medicine in 1982, after which he pursued his internship in pediatrics at Loma Linda University Medical Center. Chinnock retired from the Navy at the rank of Navy Captain after 25 years of service to his country. He recognized the need for physician leaders to be skilled in the areas of administration and policy and continued his growth and professional development by earning a master’s of science degree in health care management at Harvard’s School of Public Health in 2013. Dr. Chinnock has been a member of the California Medical Association and the San Bernardino County Medical Society for 24 years. This profile was written by Sheann Brandon and originally appeared on the Loma Linda University Health website.